The Golgi (pronounced GOL-jee) complex (or Golgi apparatus or Golgi body) was discovered by Camillo Golgi (1844–1926), an Italian physician. While Dr. Golgi was staining neurons with silver nitrate (Golgi stain), he noticed small intracellular structures made up of vesicles and fibers known today as the Golgi complex. The Golgi complex is composed of several layers of cisternae (fluid-filled membrane sacs) arranged like stacked pancakes near the outer edges of the endoplasmic reticulum (ER) near the nucleus . The Golgi complex is organized into three biochemically distinct compartments: the cis Golgi, the medial Golgi, and trans Golgi; the cis Golgi is closest to the ER. The intracellular structures known at the Golgi complex are involved in protein processing and secretion. The primary function of the Golgi complex is to modify, process, and sort newly produced proteins that arrive from the ER. These modifications include adding or deleting specific sugar molecules to modify the branched sugar structures found on newly formed proteins. For example, some of the mannose sugars are cut from the oligosaccharide branch in the cis Golgi. Upon completion of this step, the protein travels to the medial Golgi where other sugars like N-acetylglucoseamine and fucose are added to the oligosaccharide branches on the protein. Further modifications to the carbohydrates are completed in the trans Golgi. Carbohydrate additions may aid in the stability, transport, and/or function of the proteins. Two models have been proposed to explain how newly produced proteins travel from the ER to the Golgi complex and travel among Golgi stacks. One model suggests that proteins are transported enclosed in vesicles. Another model proposes that one stack of the Golgi "matures" into the next stack. This is called the cisternal progression model. Regardless of which model is correct, the question remains as to how the cell maintains the size, shape, and biochemical uniqueness of the Golgi complex. One answer is retrograde transport or recycling of enzymes and molecules from one Golgi stack back to their original stacks. Each of the vesicles that travel between the ER and Golgi stacks is coated with proteins that have "addressing tags" on them. For example, the vesicle that buds off of the ER has coat proteins that specifically direct it to the cis Golgi instead of the medial Golgi or some other organelle . Sometimes, enzymes and proteins that reside in the ER accidentally get caught in a vesicle going to the Golgi. When this happens, they return (retrograde transport) from the cis Golgi back to the ER in a vesicle coated with different proteins that are addressed to the ER. Therefore, the Golgi has two sets of vesicles flowing in opposite directions. The first set of vesicles are filled with newly made proteins awaiting further modifications traveling in a forward or anterograde direction. The second set of vesicles are filled with enzymes and matured proteins seeking their resident organelle traveling in the reverse or retrograde direction. The trans-Golgi network (TGN) is an extension of the trans Golgi where different types of vesicles are formed. The TGN can be thought of as a major protein sorting station inside the cell. Proteins maturing in the Golgi are sorted in the TGN for transport to several locations in the cell depending upon the biochemical tags that are found on the individual proteins. 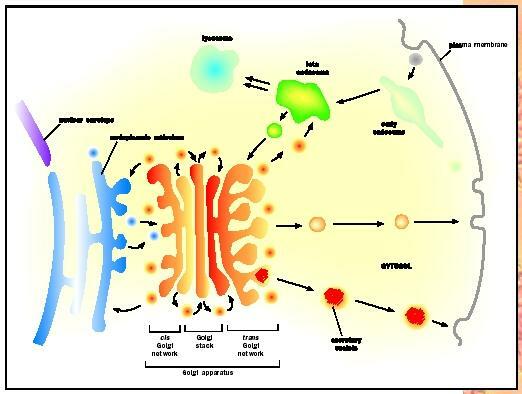 It is thought that proteins in the TGN are concentrated by linking up with receptor molecules in the lumen of the TGN. As proteins find their proper receptors, they may aggregate in one or few locations within the TGN and then bud off to form immature secretory vesicles: (1) secretory granules (vesicles that undergo further maturation and sorting of specialized cargo); (2) secretory vesicles targeted to the plasma membrane; and (3) vesicles carrying degradative enzymes to lysosomes (small, acidic organelles that degrade macromolecules ). Some selectivity and sorting of proteins may exist in these secretory vesicles before they get to the plasma membrane. First, secretory vesicles are packaged with a high concentration of a specific protein that has been transported to the TGN. For example, endocrine cells produce large amounts of specialized proteins called hormones that are packaged into secretory granules. When endocrine cells receive the correct "signal" that triggers fusion of the secretory granules with the plasma membrane, these proteins are released into the circulatory system. Second, some proteins are produced and secreted in a constitutive or constant manner; these proteins do not rely on extracellular signals for release and are not sorted to secretory granules. Instead, constitutive secretion involves vesicles originating at the TGN and traveling directly to the plasma membrane for exocytosis. Finally, the TGN is a sorting station for the delivery of degradative enzymes to lysosomes, vesicles containing nutrients that originated outside of the cell. Cells need to target these proteins to acidic lysosomes to assist in the digestion of internalized nutrients. Proteins destined for the lysosome have been modified with a unique sugar called mannose 6-phosphate. These lysosomal proteins are sorted in the TGN by binding to the mannose 6-phosphate receptor that then buds off in a vesicle that fuses with a lysosome. The low pH in the lysosome causes the mannose 6-phosphate bearing protein to dissociate from the receptor. The empty receptor buds off from the lysosome in a small vesicle and is recycled to the TGN. The Golgi complex plays an essential role in the sorting and targeting of proteins to various parts of the cell. Despite what is known, there are still many unanswered questions concerning the exact mechanisms involved with sorting and transporting cellular cargo throughout the cell. This is an important area of investigation since many diseases such as I cell disease, Alzheimer Disease, Batten's disease, and a host of other protein and lipid storage diseases are a result of cells missorting protein and lipids to the wrong locations in the cell. Balch W. E., and B. A. Bernard. "Protein Sorting by Directed Maturation of Golgi Compartments." Science 285 (2 July 1999): 63–66. Camillo Golgi is most noted for his studies with the human nervous system and shared the 1906 Nobel prize with Santiago Ramon y Cajal in the field of medicine. A defect in the enzyme that tags proteins with mannose 6-phosphate causes I cell disease, marked by skeletal deformities, movement difficulty, and early death. In a typical transgenic system where you insert a gene under constitutive promoter, what would be the fate of the gene product. I mean will it get exported to outside the cell by vesicles? I would appreciate clarifying this doubt.